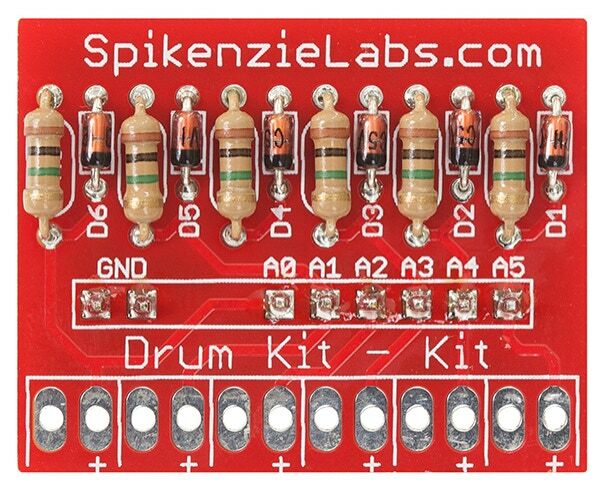 The Drum Kit - Kit lets you turn your Arduino into a drum kit. Imagine the fun you could have building a drum kit and then “rocking the house”. 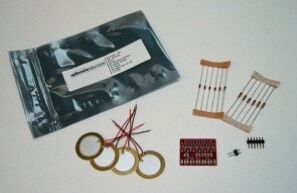 The kit contains the electronic parts required to make a drum kit. This includes the circuit board, resistors, diodes and pins. You supply the Arduino and the material to make the actual drum pads. Below you will find the easy instruction on how to make traditional looking drum pads, but you could also stick the piezos (the part the sense the hits on the drum) to many different surfaces. Imagine, playing your desk, lamp and telephone ! The Drum Kit Kit: comes with four piezo sensors, PCB and other parts needed to make it work with the Arduino as a mini shield. 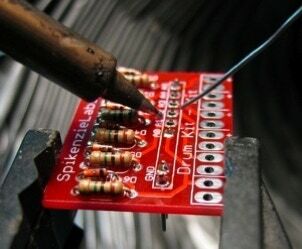 Get the Drum Kit - Kit and your soldering iron and solder. Remove the paper from the resistors and the diodes. 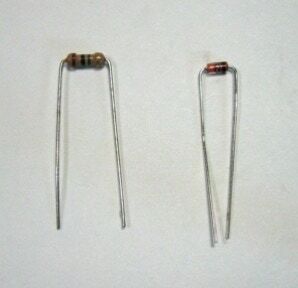 Bend all of the resistors and diodes like this. Only use your fingers to bend the leads against the part’s body. If you use a tool or a table top you may crack the part. Push all of the resistors and diodes into the PCB, in the spaces marked R1 to R6 and D1 to D6. All of the resistors and all of the diodes are the same. NOTE : The black band on the diode must be oriented to the side with the white band on the PCB printing (down when the text is readable, see left). Resistors may go either way. Flip the board over and heat up your soldering iron. You may want to tape the parts onto the board, so they don’t fall out when you flip it. I prefer to tape the leads rather then bending them. When you bend them you could cause a short circuit, if you aren’t careful. Using wire snips, trim all of the leads so that they don’t stick out too much. 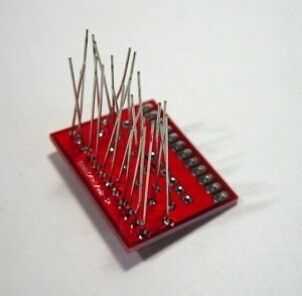 Push the male pins through the PCB from the bottom and hold them there with some tape. Solder them in place from the top. Your mini Arduino Drum Kit shield is now ready. 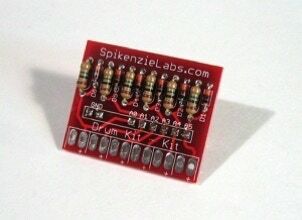 To connect your drum pads to the Drum Kit PCB see step 16 in the making pads section below. There are a lot of options for building your drum pads. You can make them out of wood, metal or other objects. On our How to make Drum Pads page , there is a detailed description of how to build them using sheet metal, mouse pads and packing foam. Cutting disks to give the drum pad some body. Sanding so that the glue used for the piezo holds more strongly. Gluing the piezo on with two-part epoxy. Making tops for the drum pads out of neoprene mouse pads. Drum pads mounted onto a board. Spray adhesive was used to glue the layers together. At the bottom edge of the Drum Kit PCB, there is space to connect six drum pads. 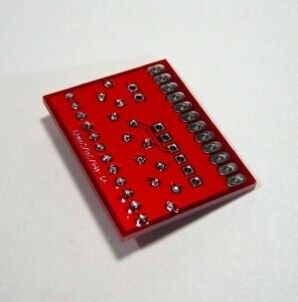 Each pad should go to one of the sets of pads with the wire that is connected to the red lead of the piezo to the + solder pad and the black wire from the piezo to the other. 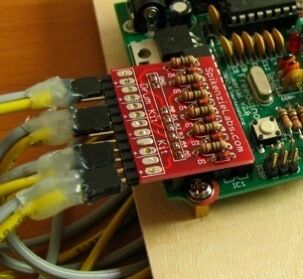 NOTE: Connect only wire from red wire of piezo to a + solder pad. To connect the drum pads to the Drum Kit, you have some choices. 3. Solder to RCA jacks and use other RCA jacks at the drum pad end, with an RCA cable. NOTE: Only for people wanting to use a hardware MIDI interface. 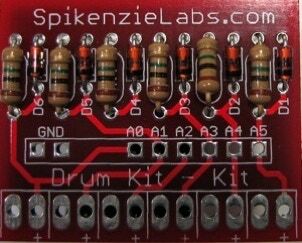 If you have a hardware based MIDI shield, you could also use it with the Drum Kit - Kit. Follow the directions that it came with, most often, you will simply use the TX serial pin of the Arduino and connect it to point were the shield gets the serial data to send out over the MIDI cable, you may also have to change the baud rate in the sketch. Connect the Drum Kit to your Arduino. The solder pad where the drum pads wires connect will hang off the bottom edge of the Arduino and the six pins on the Drum Kit will fit into the six analog pin holes on the Arduino, with the two other pins fitting into the two ground pin holes. Download the Drum Kit - Kit Arduino sketch. Start the Serial MIDI Converter software, choose the serial port that your Arduino is using and the virtual MIDI ports that you set up in Step 1. Start you music software and hit some drums ! The most common change the you will probably do to your Arduino Drum Kit sketch is change the musical note associated with a each pad, you may want a particular pad to be a snare drum and another to be a cymbal etc..., you decide. The other type of tuning has to do with getting the best playing performance out of your configuration of drum pads. Since, you will be making your own drum pads, some people will use harder foam then others, some people will place their pads closer together then others and in other cases the type of length of wired used to connect the pads will affect the way the drum kits plays. Area in the Drum Kit sketch where the user can tune the drum kit for their set-up. Here is an explanation of the different areas where you can tune your drum kit. PadNote: These are the MIDI notes that will be played when a drum pad is triggered. They range from 0 to 127, where middle C is the number 60. Do not use a value above 127. PadCutOff: The Arduino reads analog values as a number from 0 to 1023. When you hit a drum pad the piezo creates a voltage spike and ripple. We are reading the value of this voltage spike. The padCutOff is the minimum value of this spike that we will accept as a drum hit. You can set it higher or lower. Lower will make more false triggers, but easier to make drum hits if your pads are thick. Higher will require you to hit the pads harder to make them sound, but you will get less false triggers from hitting a nearby pad if they are on the same surface. MaxPlayTime: Is a delay based on the number of times the main loop of the program runs through. This delay is intended to keep the kit from sounding multiple hits for one drum hit, since the Arduino is fast enough to read the same voltage spike a few times. If you are getting two hits etc, when you hit the drum only once, increase this number if there is too large a delay when you play a drum roll, then decrease this number. midichannel: Is simply the MIDI channel that will be send in the MIDI message. VelocityFlag: Is a true or false setting to use velocity or not. Velocity is the value of how hard you hit the drum pad. A higher velocity would produce a louder drum sound.